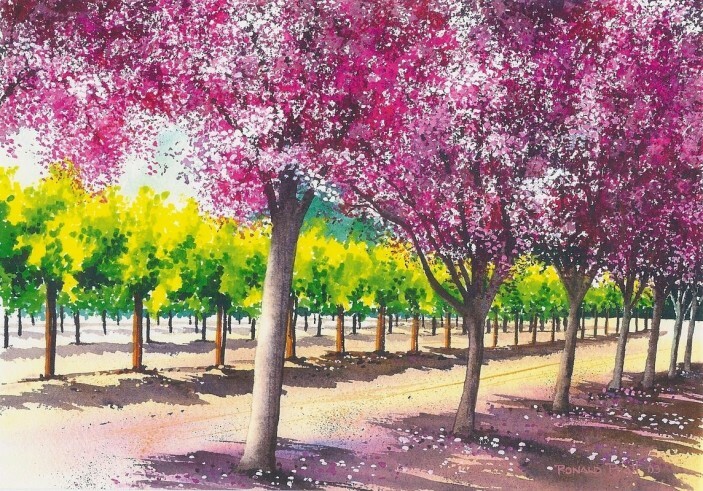 Spring has sprung and Temecula Valley is celebrating with some unexpected wines! For the seasoned wine-lover, these unusual varietals offer a new and surprising twist to the classic wine tasting experience. Check out our recommendations for some exciting wines coming out of Temecula Valley wine country. Now that’s something worth toasting – cheers! California sparkling wine is primarily made with chardonnay and pinot noir – but here are a few surprising sparklers to liven up your spring table! South Coast Winery grows a large variety of fascinating grapes in Temecula Valley. This winery estate currently offers Sparkling Gewurztraminer (a popular German grape) and Sparkling Pinot Grigio (Italian white grape), both at $18. 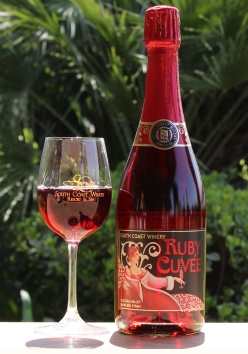 Their famous Ruby Cuvée* ($22) is bright red in color and made from syrah, which is a key grape from the Rhone region of France. The stylish bottle makes a favorite host gift for bridal showers, anniversaries, Valentine’s Day and other girlie special occasions. Thornton Winery offers a similar sparkler: their syrah/grenache blend – N.V.** Cuvée Rouge – retails for $24. Counoise Blanc de Noir Sparkling ($24), produced by Oak Mountain Winery, offers an unusual sparkling wine – fruit-forward with a blush color and an earthy finish. Food Pairing Tip: What should I eat with these wines? Pair these spring sparklers with some seasonal fruit (oranges, cherries and strawberries) and locally-sourced cheese. We recommend a visit to Temecula Valley Cheese Company (951-693-9500.) Or top off with some OJ and you’ve got yourself one classy mimosa to serve with a simple spring frittata. Commonly found in Spain and Portugal, Albariño is a lesser-known white grape which does very well in Temecula Valley. Keyways Vineyards & Winery produces this bottle for $23, along with the French grape Roussane ($29) which is similar in taste to Viognier. Bright, zesty and crisp, French fave Sémillon makes an appearance at the micro-boutique winery, Doffo Vineyards. Wilson Creek Winery’s Spring White ($18.99) is a light and refreshing choice, and an obvious selection given the season. Sip these rare white wines alongside citrus-marinated salmon or a light asparagus & pea pasta dish topped with Parmesan. Might we also suggest a spring-vegetable paella? Food Pairing Tip: What should I eat with these? Quick crab stew in tomato-fennel broth or Mediterranean grilled chicken salad not only pair well, but are simple weekday supper options when you want to keep things light and easy.